Florida has experienced the effects of 4 hurricanes over the past 3 years. The interesting thing about the last three years is that they have been relatively average when it comes to total hurricane activity in the southern Atlantic. Hurricane Michael devastated the panhandle in 2018, a year that had only 8 hurricanes form. Compare that to 2010, which generated 12 hurricanes, with not even one affecting Florida. It brings home the fact that, “all it takes is 1 storm” to cause tremendous damages. Here in Florida, we should always be prepared. 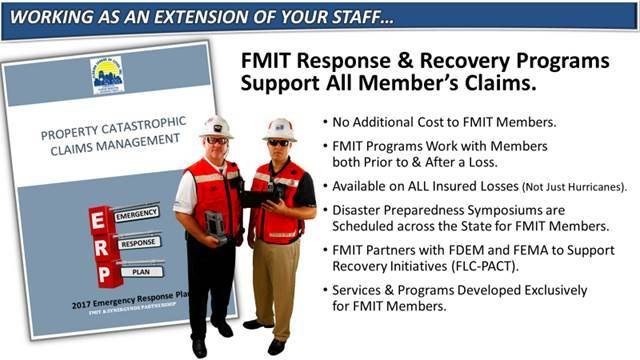 FMIT and its Turnkey Recovery Program have been on the front lines for all four hurricanes, as well as assisting Members on every day property losses that occur due to fire, flood, severe weather, sinkholes and more. While every Member is different, FMIT has learned that, even with the best continuity and response plans in place, those plans cannot be implemented if the people who support them are not able to get to work or don’t have power and utilities necessary to operate basic municipal functions. This is something that many Members in the panhandle experienced after Hurricane Michael. So, even if you have the best plan, you need a trusted team that can focus on mitigating damages, stabilizing and rebuilding your buildings and structures while you focus on caring for the needs of your citizens. FMIT’s Turnkey Recovery Program is the leading municipal property recovery program and is exclusive to FMIT Members in the state of Florida. No other municipal insurance provider puts the amount of effort and resources into ensuring their Members are protected from disasters. FMIT understands that most Members cannot retain or employ Disaster Recovery Managers. That is why they created the FMIT Turnkey Recovery program. 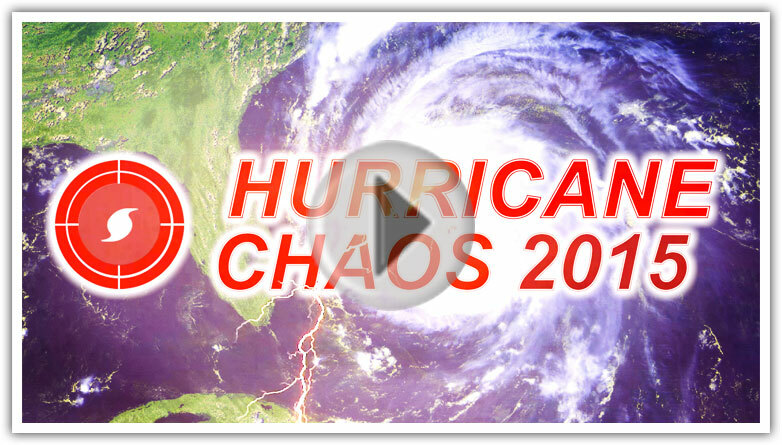 Designed to assist Members after everyday losses to covered property, as well as before, during and after catastrophic events (hurricanes, tropical storms, flooding, etc. 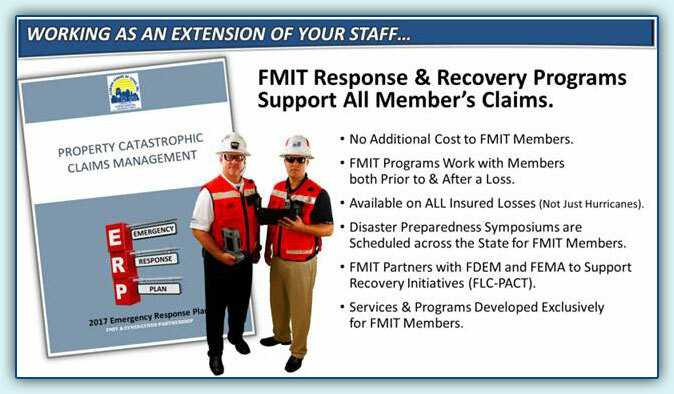 ), FMIT’s Turnkey Recovery program provides its Members with a disaster recovery management team combined with a direct repair program that pays vendors directly, conserving Member operating resources, reducing claim costs due to delayed mitigation and stabilization, and speeds overall recovery. The FMIT Turnkey Recovery program also ensures that FEMA Public Assistance grant compliance is maintained in order to assist with reimbursement of non-insured losses. This year’s seminar will review the lessons learned from past catastrophic events and review the updated FMIT Turnkey Recovery process, as well as how Members can receive the many benefits that the program has to offer. Led by FMIT and SynergyNDS personnel who actively manage recovery efforts, this event will allow FMIT Members to understand exactly where the FMIT Turnkey Recovery program benefits them and how to integrate it into their own emergency response and recovery procedures. The information in this seminar will be critical in future catastrophic events and can save countless hours and up to millions of dollars of exposure to FMIT Members. Click Here to register for the 2019 Central Florida Seminar. Click Here to register for the 2019 City of Sunrise Seminar. Click Here to register for the 2019 Charlotte County Seminar. Click Here to register for the 2019 Panama City Seminar. 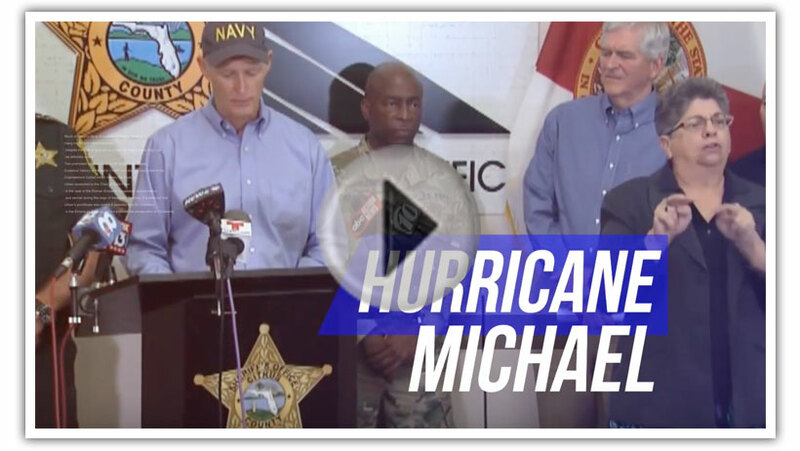 Watch how the FMIT and SynergyNDS provided disaster response and recovery before, during and after Hurricane Michael Made Landfall in the Florida Panhandle. While the FMIT and its Members were very fortunate that Hurricane Matthew did not develop into a significant catastrophic event, the FMIT was ready with response and recovery efforts. 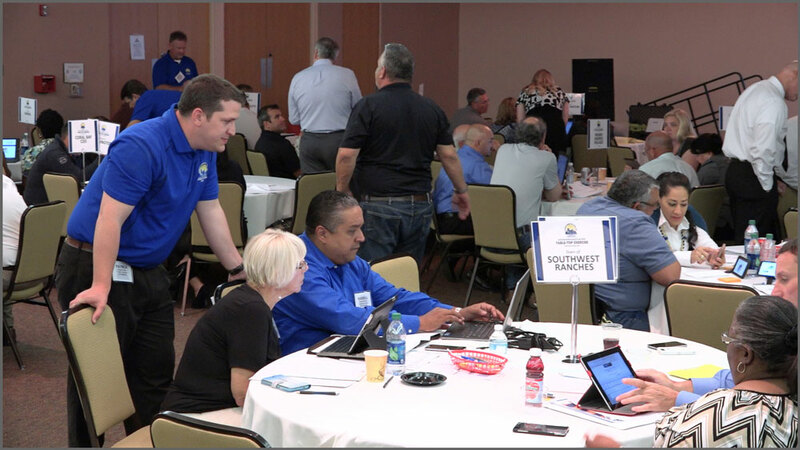 The FMIT Table-Top Exercise informs Members on the various workflow and reporting challenges that might be experienced during certain types of unplanned events. City of North Miami Risk Manager Karen Muir discusses the benefits of the table-top exercise. After a disaster is the wrong time to find out that you weren’t prepared. If you have a responsibility for protecting your insured property, this seminar is for you.